I’ve fixed the html on this post a dozen times, and each time I hit “Update,” things get screwy again. I don’t understand what’s happening, but I can’t fight it anymore. If it looks messy, sorry about that, just move on to the body, and I’ll try again after work today. This is the fourth James Ryker novel, but the first I’ve read. This leaves me at somewhat of a disadvantage — but not an insurmountable one. Someone from his past reaches out to him — in an unconventional manner — for some help. Janet Campbell, the widow of the man who trained Ryker, who molded him into the intelligence agent/assassin he’d become is worried about their son and wants Ryker to step in for his sake. Now, I don’t know if the series has featured Campbell or Charles McCabe (her husband) before — it’s not unheard of for a thriller to introduce an old, dear friend mid-series just to get the protagonist involved in something. I’m sure if they were around early on, returning readers were invested right away. But if this was their first appearance in the series, Sinclair introduced Campbell in such a way that it worked for me as a hook — I was invested because of Campbell more than because of Ryker. Scott Campbell really never connected with his father, and his life has gone in a very different direction. He was an accountant at a prestigious London firm until recently, leaving under a cloud. He and his girlfriend, Kate Green, left England to get away from that cloud and moved to New York City for a fresh start. Well, mostly fresh. Kate’s father, Henry Green, is a fairly notorious criminal and nightclub owner. To make a little money, Scott does a few odd jobs for Henry (while Kate dreads Scott’s participation in her father’s business). Those odd jobs grow more serious as Green begins to trust him more. Which is precisely the thing that Janet Campbell is worried about. So, enter James Ryker — a former intelligence officer between gigs. Once he arrives in NYC, he spends some time surveilling Scott and Kate to see what exactly is going on, and then he goes all-i to try to extricate them from the dangerous position that Scott has put them in. 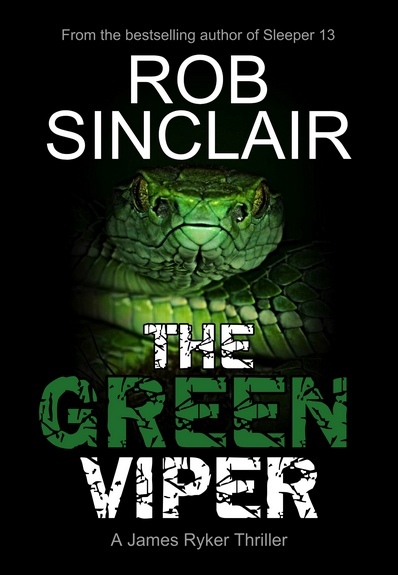 Which is a lot more dangerous than Ryker knows, as another drug dealer tries to move in on Green’s turf, and the FBI are preparing to make a few arrests. 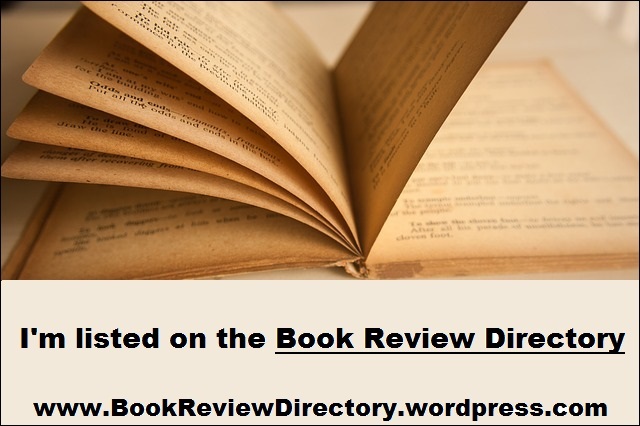 What follows is exciting, tense, fast-paced and full of more surprises than I expected. Okay, that sounds like a tautology — with a book like this, you expect a few things to occur that you don’t expect (whatever that might end up being). The Green Viper gave me more of those things that I didn’t expect. A couple of them were pretty big surprises, too — so more and of greater magnitude than I expected. The characters were well-drawn, but they all could’ve been a bit more three-dimensional. No one that we spent much time with at all was exactly two-dimensional (thankfully, I’ve had too much of that lately), but they all could’ve had a little more. By and large, for a thriller with this many moving pieces the characters were either as well-drawn as you might assume to meet, or a little better. Still, I want more. Characters are what hook me more than anything else in a book, and these were good enough, but I wanted more. Particularly Ryker — he’s the title character, and I really don’t think I know much more about him than I do any of the other characters (I might know Scott the best), and that doesn’t seem right. The other thing I would’ve liked more of was the actual work done by Ryker. Not just him showing up where Scott doesn’t expect him — but how he got there, why he decides to show himself to Scott then. For example. From Finder to Child to Sharp and beyond, it’s the mechanics of their intelligence work that draws me in as much as the fight scenes or whatever. Sinclair is good at delivering the big moments — gun fights, chase scenes, and the like. But he could do better with the smaller moments — trailing someone, deciding to follow this line of investigation or reasoning. I guess you could say the story’s strong, it just feels like he has to many ellipses in it — let me see more of the connections between the moments. Basically, I’m saying that I enjoyed the book — but I thought Sinclair could’ve given his readers a little more of everything. It was a good novel, but with a little more it could’ve been really good. The pacing is good, you get drawn in and the story really doesn’t let you go. I technically spent 2 days reading this, but about 80 percent of that was in one sitting — If I’d put off starting by a day, it would’ve been a one-sitting kind of book — start it, get sucked in and ignore the world until the bullets stop flying and the smoke clears. A very satisfying way to spend a couple of hours. I enjoyed this book, the characters and the world Sinclair has created. Might I have had more appreciation for some of this if it weren’t my first Ryker novel? Sure. 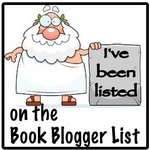 Am I curious enough about what I read to come back in book 5 (or go back to books 1-3)? Yeah, I think so — Sinclair’s a capable author and he’s got himself a fun world to play in. You should give this one a try — or one of the earlier books — and I’m willing to bet that you’ll end up agreeing with me, Rob Sinclair’s James Ryker is an action hero worth your time. 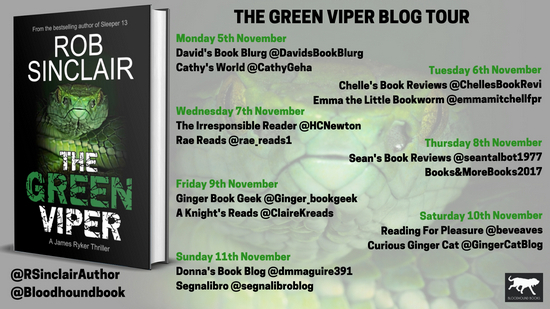 Today I welcome the Book Tour for the action packed The Green Viper by Rob Sinclair. Along with this spotlight post, I’ll be giving my take on the novel here in a bit.